Bell’s Palsy, also known as 7th nerve palsy, is a result of temporary weakness or permanent paralysis of the facial nerve. 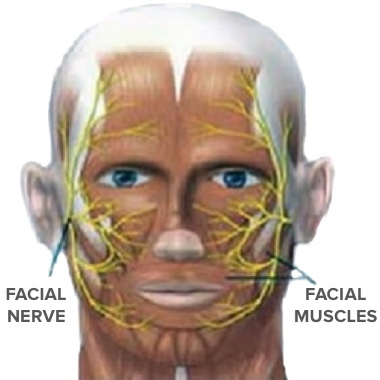 This nerve controls muscles of facial expression, eyelid movement, and muscles of the forehead and neck. Most of the time Bell’s Palsy involves one side of the face, however bilateral cases have been reported. Dr. Parsa is a member of the Institute for Facial Paralysis. This is a multi-disciplinary team approach to treating patients who have been affected by this disabling disorder. His surgical skills in reconstructive surgery have been featured on the Discovery Health Channel and multiple media outlets around the world. In this section we hope to be able to answer some of your questions about Bell’s Palsy. If you need further assistance or have other questions or comments please feel free to contact us today. Is Bell's Palsy the same thing as Facial Paralysis? How do I know if I have Bell's Palsy? What causes Bell's palsy or facial paralysis? Are male and females affected equally? Is there a specific age that people are affected more often? What are some of the functional and aesthetic impairments associated with facial nerve paralysis? Why can I open my eyes but not close them? Why do my eyes tear? Why do I feel like there is something constantly in my eyes? What other things can happen if I am not blinking? I use artificial tears and ointments all the time. Are there any surgical procedures that can help? Why and how is a Gold weight placed? I am embarrassed to eat or talk in public places because of Bell's palsy. What can be done for me? 1. Is Bell's Palsy the same thing as Facial Paralysis? 2. How do I know if I have Bell's Palsy? The 7th cranial nerve is normally responsible for facial expression. This means that every time you smile, laugh, blink, wink, close your eyes, raise your brows, frown, blow a whistle, and make funny faces you are using this nerve to stimulate your facial muscles. If suddenly or progressively you can’t do any or some of these things, this could be a sign that you have Bell’s palsy. 3. What causes Bell's palsy or facial paralysis? A lot of times a definitive cause is hard to find. Viral infections such as herpes simplex virus (HSV) have been associated with Bell’s palsy. Other causes include: 1) birth trauma, 2) temporal bone fracture, 3) facial trauma, 4) diabetes, 5) pregnancy, 6) acute or chronic otitis media (middle ear infection), 7) other infections such as mumps, mononucleosis, Lyme disease, and tuberculosis, 8) toxicity from Thalidomide, tetanus, or carbon monoxide, 9) tumors such as acoustic neuroma, facial nerve neuroma, fibrous dysplasia, or metastatic tumors from other parts of the body, 10) multiple sclerosis, 11) myasthenia gravis, 12) sarcoidosis, 13) amyloidosis, 14) Wegener’s Granulomatosis, and 15) Kawasaki disease. There are other causes not listed, so we recommend a comprehensive evaluation by someone who is an expert in this field. 4. How common is Bell's Palsy? In the United States the rate of Bell’s palsy is about 20 to 30 cases per 100,000 population. Worldwide the rate is approximately 10 to 30 cases per 100,000 population. 5. Are male and females affected equally? 6. Is there a specific age that people are affected more often? Facial paralysis or Bell’s palsy can affect patients at any age. The mean age of onset is early to mid forties. Higher predominance is seen in patients older than 65 years of age, and a lower rate of incidence is observed in children younger than 13 years old. 7. What are some of the functional and aesthetic impairments associated with facial nerve paralysis? There is facial asymmetry, depression of eyebrows, inability to close the eyelids (lagophthalmos), paralysis of the lower eyelid (ectropion), decreased tear production, corneal damage, mid-face drooping, nasal airway obstruction secondary to external valve collapse, inability to smile (asymmetry), oral incompetence and drooling, and lower lip deficit. 8. Why can I open my eyes but not close them? Cranial nerve 7 is responsible for closing the eyes. This is why patients affected by Bell’s palsy will have trouble closing their eyes. Opening the eyes involves the use of your 3rd cranial nerve which should not be affected by Bell’s palsy. 9. Why do my eyes tear? There are a multiple reasons why most patients with Bell’s palsy complain of tearing. For one thing, the affected eye is not blinking as often, resulting in exposure of the eye to air and thus dryness. 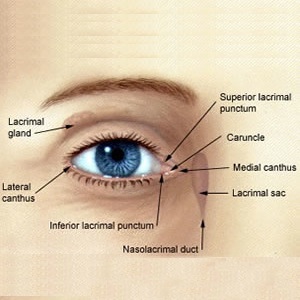 When this occurs, the brain will sense that the eyeball is dry and will command the lacrimal gland to produce more tears. Another reason one tears constantly is that the blinking mechanism is needed to help drain the tears into the nose. That’s right, into the nose (this is why we get a runny nose every time we cry). If this process is interrupted, the produced tears will run down the face. The third reason there is excessive tearing is due to lack of tone of the lower eyelid. 10. Why do I feel like there is something constantly in my eyes? The affected eye is not blinking as often, and the eye gets dry. This is sensed by the brain as if there is something constantly in the eyes. 11. What other things can happen if I am not blinking? The worse thing that can happen if you are not blinking often is that the affected eye will get dry and an ulcer or infection can occur on the cornea. This is a serious problem because it can lead to blindness. Aggressive lubrication with artificial tears and ophthalmic ointments is necessary to prevent this from happening. In severe cases the eyelids may need to be patched or taped shut at night. 12. I use artificial tears and ointments all the time. Are there any surgical procedures that can help? Yes. Once you have been evaluated by Dr. Parsa, he will customize a treatment protocol for you individually. This may include the use of Gold weights to help close your upper eyelid, correction of your loose lower eyelid, or surgical correction of everted lower eyelids. 13. Why and how is a Gold weight placed? 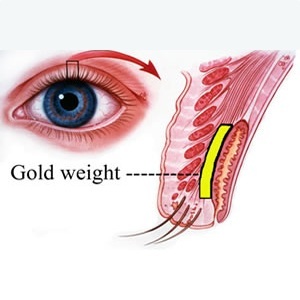 A gold weight is placed to help close the upper eyelid better. During your initial consultation, Dr. Parsa will determine the size of the gold weight needed to be inserted to help close your eye. The surgery is an outpatient procedure (you go home the same day), and it is done under local anesthesia. As can be seen in the figure, the gold weight is inserted under the muscle and over the tarsal plate. 14. I am embarrassed to eat or talk in public places because of Bell's palsy. What can be done for me? At the Institute for Facial Paralysis, Dr. Kami Parsa and Dr. Azizzadeh, a Harvard trained Facial plastic surgeon, along with a team of sub-specialists such as an otolaryngologist, ophthalmologist and physical therapist, will work closely with you to restore aesthetics and function. After your comprehensive evaluation, any of the following surgical procedures may be recommended. For the brow and eyelid region: Gold weight placement to help with upper eyelid closure, surgical tightening of the lower eyelid, and browlift to improve eyebrow position and symmetry. For the mid-face region: creation of a dynamic smile, facelift to improve symmetry and aesthetics of the face, mid-facelift, static suspension of nasal ala to improve nasal breathing, and creation of the nasolabial fold. For the lower face and lips: lower lip wedge excision, asymmetric facelift, and dynamic lip.